Collects at Sts. Sergius and Bacchus. The Byzantines built at least five churches in Rome to the honor of the martyrs Sergius and Bacchus. The one where the people collected for the procession to the Basilica of Pudens, was called the Canelicum, and stood in the regio of the Montes. The titulus sancti Pudentis was one of the oldest of the urban titular churches; ancient ecclesiastical tradition asserts that it was sanctified by the sojourn of Peter in the house of the senator Pudens, mentioned by St. Paul in his epistles. The memories of Pope St. Pius I (158-67), of his brother Hernias, the mystic author of the Pastor, those of Priscilla, Pudentiana, Praxedes, Justin the Philosopher, Hippolytus the Doctor are all connected with the history of this house; it was really the papal residence in the second century. The Station at Pudentiana. The Lessons and prayers may have reference to St. Peter, whose presence in the house of Pudens was the cause of all manner of prosperity and abundance. Charity and hospitality never impoverished anyone, and when the needy are given shelter for the love of God it draws down upon that roof the blessings of divine Providence. I have cried to thee, for thou, O God, hast heard me: O incline thy ear unto me, and hear my words. Shew forth thy wonderful mercies; thou who savest them that trust in thee. From them that resist thy right hand keep me, as the apple of thy eye. Protect me under the shadow of thy wings. v. Glory be. . .
Now a certain woman of the wives of the prophets cried to Eliseus, saying: Thy servant my husband is dead, and thou knowest that thy servant was one that feared God, and behold the creditor is come to take away my two sons to serve him. And Eliseus said to her: What wilt thou have me to do for thee? Tell me, what hast thou in thy house? And she answered: I thy handmaid have nothing in my house but a little oil, to anoint me. And he said to her: Go, borrow of all thy neighbors empty vessels not a few. And go in, and shut thy door, when thou art within, and thy sons: and pour out thereof into all those vessels: and when they are full take them away. So the woman went, and shut the door upon her, and upon her sons: they brought her the vessels, and she poured in. 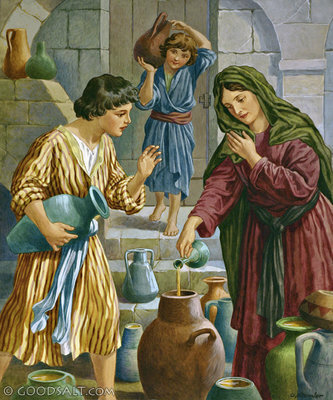 And when the vessels were full, she said to her son: Bring me yet a vessel. And he answered: I have no more. And the oil stood. And she came, and told the man of God. And he said: Go, sell the oil, and pay thy creditor: and thou and thy sons live off the rest. Who can understand sins? from my secret ones cleanse me, O Lord: And from those of others spare thy servant. V. If they shall have no dominion over me, then shall I be without spot: and I shall be cleansed form the greatest sin. The right hand of the Lord hath wrought strength: the right hand of the Lord hath exalted me: the right hand of the Lord hath wrought strength. I shall not die, but live: and shall declare the works of the Lord.